Kathmandu, 26 March 2018 (UN Regional Centre for Peace and Disarmament in Asia and the Pacific) – The United Nations Office for Disarmament Affairs, through its Regional Centre for Peace and Disarmament in Asia and the Pacific is organizing a workshop to engage Member States of Asia in the high-level fissile material cut-off treaty expert preparatory group consultative process. The workshop will be held from 27 to 28 March in Bangkok, Thailand. 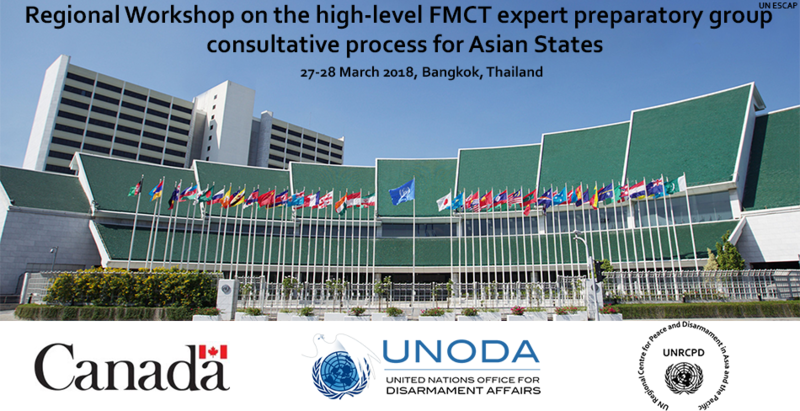 The goal of the two-day meeting is to facilitate dialogue among States of Asia on the implications of a future treaty, develop a sense of ownership of the issue and its relationship with already existing global and regional instruments in the field of nuclear disarmament and non-proliferation. It will also provide a forum for interaction with members of the High-Level FMCT Expert Preparatory Group and sharing knowledge and information on issues relevant to banning the production of fissile material. Experts will brief participants on the possible elements of a treaty banning the production of fissile material and provide insights on the respective work of the Conference on Disarmament, the 2014-2015 Group of Governmental Experts and the High-Level FMCT Expert Preparatory Group. The workshop is made possible with the financial support by the Government of Canada. For further information, please contact Mr. Yuriy Kryvonos, Director of the United Nations Regional Centre for Peace and Disarmament in Asia and the Pacific, at info@unrcpd.org.